New polls show the Greens performing underwhelmingly in the Western Australian seats; and some historic context for potential Labor defeats in Longman and/or Braddon. Legalise Vaping Australia has published results of ReachTEL polling from the neglected seats of Perth and Fremantle, which turn up no surprises so far as their finding that both seats will be easily retained by Labor is concerned. However, the results are notably weak for the Greens, who record 18.6% in Perth and 17.0% in Fremantle after exclusion of the undecided (8.7% and 6.1% respectively). In particular, the Greens are placed slightly behind the Liberal Democrats in Fremantle, who clearly stand to harvest votes from homeless Liberal supporters. On to more important matters, namely the Longman and Braddon by-elections, and some historical context for them. Much is being made of the fact that the only time a government party has gained a seat from the opposition at a by-election was in the fairly unusual circumstance of Kalgoorlie in 1920, after Labor member Hugh Mahon was expelled from parliament for seditiously describing the British Empire as a “bloody and accursed despotism”, apropos its recent conduct in Ireland. However, by-elections in highly marginal opposition-held seats have been a far from common occurrence, particularly in recent times. The last time there was a by-election in an opposition-held seat with a margin of 5% or less was in November 1983, early in the life of the Hawke government, when the Liberals retained the Brisbane seat of Moreton with a slight swing in their favour. 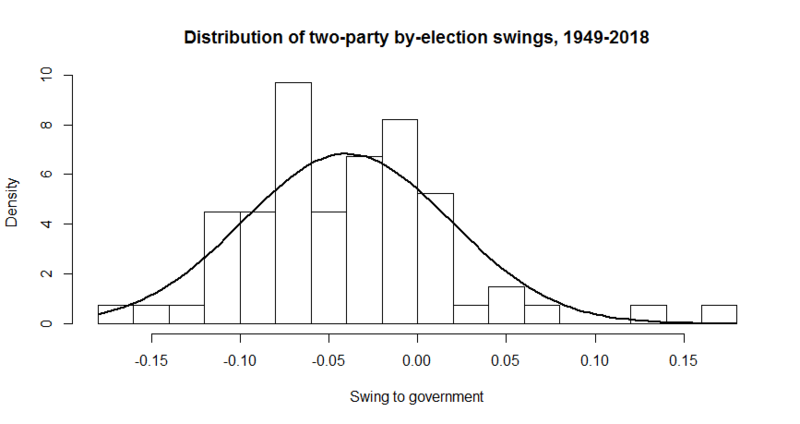 The histogram below shows the spread of swings for or against the government at the 67 by-elections that produced a Labor-versus-Coalition two-party result since 1949 (sourced from this Parliamentary Library paper). Thirteen recorded swings to the government, of which eight occurred in opposition-held seats, but in no case were they sufficient to gain them the seat. Ten of the pro-government swings were bigger than Labor’s 0.8% margin in Longman, and five were bigger than the 2.2% margin in Braddon. The mean result, indicated by the peak of the distribution curve, is a 4.0% swing against the government. However, the dispersal is great enough to suggest 0.8% pro-government swings occur 20.7% of the time, and 2.2% swings occur 14.5% of the time. On this basis, the chance of one or the other being lost by an opposition that faced both simultaneously would be 32.2% (assuming the two results were independent of each other). This is no doubt inflated by two outlier results: Australian Capital Territory in 1970 (13.8%) and McPherson in 1981 (16.2%). With these removed, the likelihood of a 0.8% swing to the government is 13.5%; the likelihood of a 2.2% swing is 8.2%; and one or the other is 20.6%. There is a part of me who wants the Liberals to win both Longman and Braddon tomorrow. Because Tony Abbott needs to be brought down a peg or two and only the Liberals winning both seats will ensure this will occur. I am so aprehensive about tomorrow I don’t want to make a prediction. I am excited. When was the last time a Downer lost in SA? Albo has only said that he won’t ‘challenge’ Shorten. He didn’t say that he wouldn’t be a leadership candidate if a ballot were to take place. Rudd had also denied many times that he would challenge Gillard. Rudd’s supporters then forced Gillard to call a ballot, by starting the process of circulating a caucus petition for a challenge. Rudd stood as a candidate and won. If the by-election results on Saturday are bad, then I would expect similar pressure to be put on Shorten, to either resign or else call a leadership ballot, without Albo necessarily openly ‘challenging’ Shorten. Ghost on twitter reporting 51-49 to ALP in both Longman and Braddon. Newspoll apparently. Yes the result in Newspoll, via Ghost who Votes, only TPP, for both Longman and Braddon is 51:49 to Labor. Noticed a change in the wind this afternoon, when Liberal officials were recorded saying no matter the result in the by elections, Turnbull is a winner. This was the first time they have countenanced they won’t win any of the three seats. I see comment earlier about Bill collecting the kids from school. I reckon their internal polling confirmed that they have all contested seats in the bag so he took the day off. After all the trash Shorten has had to wear from Turnbull et al, and Media hacks, wins in Longman and Bradden will be a fantastic result. Good luck on the booths tomorrow(still Perth time here) everyone. Bill didn’t campaign on last day to avoid dumb questions about his leadership. Very smart.